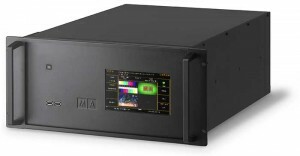 With the MA VPU light (Video Processing Unit), MA Lighting has developed a smart and compact video control offering nearly the same performance as the successful MA VPU plus and MA VPU basic. Only 2HU height, the MA VPU light features sophisticated hardware and proven MA software. Furthermore the in-built screen displays all essential information about the status of the MA VPU light. Additionally MA has enhanced its MA VPU plus and MA VPU basic in comparison to the MA VPU light. All MA VPU will now offer Full-HD (MA VPU plus MK2 6 layers, MA VPU basic MK2 4 layers, MA VPU light 2 layers - which are rendered in parallel). Also MA VPU plus MK2 and MA VPU basic MK2 are now equipped with 3 x DVI-outs instead of two as with the prior version, while the MA VPU light offers 2 x DVI-outs and 1 x VGA-out. All MA VPU have common features enabling all videos, still images and 3D objects to be scaled, positioned, tiled, colored and manipulated directly from any grandMA2 console. It is as simple as controlling any other fixture – the MA VPU just has to be added to the network session – no additional paramaters are needed. The MA VPU don’t need parameters in the network as they calculate these themselves. The whole operation relies on the highly intuitive well-established MA philosophy. So if you know grandMA2, you know the MA VPU. Thanks to the power of the MA VPU all videos can be displayed in up to Full-HD. Furthermore, the internal output synchronization of the MA-Net2 ensures the highest frame and DMX synchronicity. Horizontal and vertical soft-edge blending as well as keystone correction help to scale videos to any size desired. Size doesn't matter! More than that, the MA VPU offers convenient 3D keystoning functionality and enables the user to fit content to any 3D objects, regardless of size and shape. Additional improvements to frame interpolation and smooth speed control can be used to adjust the playback speed as well as anti-aliasing to smooth the mapping of the projection. Beyond that, there is a myriad of functions, features and effects available like frame blending, colour boost, dynamic colour key, contrast, brightness, hue, saturation as well as blur, sepia, black/white, ocean and invert plus many more. All can be easily accessed and are self-explanatory in their use. Combinations of videos and still images can be mixed and controlled, with JPEG images and standard windows bitmap images such as *.bmp as well as *.gif supported. There are no differences between the different types of MA VPU hardware – except the overall performance. The MA VPU can be programmed via the grandMA2 console in blind and preview modes. This means that the MA VPU follows the console to blind and preview which simplifies programming considerably. Also the MA VPU has a new Single-Layer-Crossfade mode which allows the user to program all content on the same layer. Based on the rock-solid technology of MA Lighting, the MA VPU suits all your needs and is optimised for transportation, longevity and on-the-road use. Each MA VPU comes with a pre-installed content library comprising more than 17GB of professional content.